The finished building comprises a two-storey basement car park, ground floor lobby and café, plus six floors of A-grade commercial space featuring offices and meeting rooms. PACT navigated a complex site, particularly during the early stages of construction. 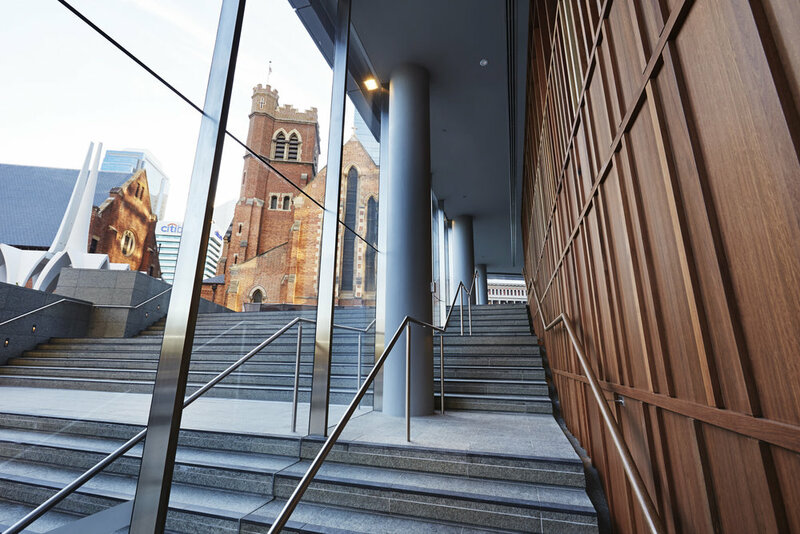 The proximity of existing heritage listed structures surrounding three sides of the building site – St Georges Cathedral to the west, The Anglican Diocese Deanery to the south, and the Public Trustee building to the north posed significant challenges when constructing the double basement. PACT drew upon innovative construction methods to preserve the structural integrity of these 150-year old heritage listed buildings. This included adopting a ‘top-down’ construction methodology - a complex and highly innovative construction method that required the perimeter basement walls to be constructed using a ‘diaphragm wall system. These walls were constructed first to provide support to the retained soil and adjacent buildings. Next, the ground floor slab was constructed and tied into the diaphragm walls to provide structural stability. The excavation of the soil was completed under the protection of the slab, before each floor was finished and tied into the walls as the excavation proceeded towards the lowest level of the basement. The base of the Church House building features carved stone and platforms that restore the ground plane around the Chancel of the Cathedral, providing pedestrian connections through the newly constructed Cathedral and Treasury precinct. A curved engineered facade will wrap around two sides of the structure, offering unimpeded views to the Cathedral and Stirling Gardens. The remainder of the building provides A-grade office space fitted out to impeccable standards. The building achieves both a 4-star Green Star rating and 4.5-star NABERS rating, ensuring that it operates efficiently and productively while also guaranteeing lower operational costs. PACT is incredibly proud adding another chapter to its successful history of delivering optimal quality developments within strict guidelines.